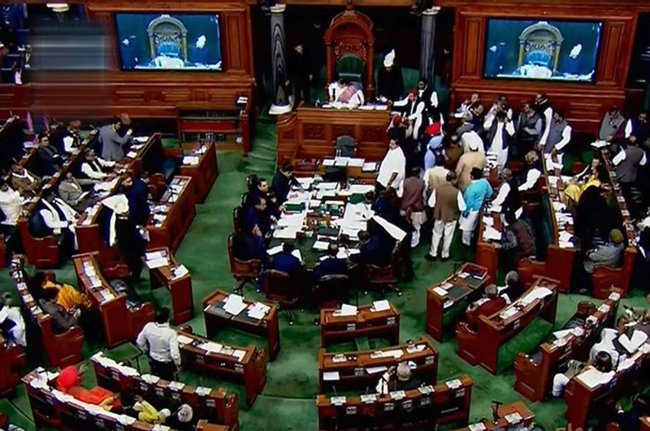 New Delhi, Feb 11: The Lok Sabha on Monday witnessed uproar over Bharatiya Janata Party’s alleged bid to topple the coalition government of Congress and Janata Dal (Secular). As soon as the Lok Sabha assembled for the day, Congress MP K C Venugopal sought Speaker Sumitra Mahajan’s permission to speak on the issue of “Operation Lotus” by the BJP. He alleged that the efforts to bribe the Congress MLAs in Karnataka was going on and Prime Minister Narendra Modi and BJP President Amit Shah were also purportedly involved in it. The Speaker did not allow him to speak on the issue. She, however, assured Venugopal, who is also the general secretary of the All India Congress Committee and in charge of the party’s affairs in Karnataka, that she would allow him to speak on the issue after the Question Hour. She then started the proceedings of the Question Hour. But the Congress MPs were not ready to relent even after the assurances from the Speaker. Some of the Congress MPs came to the well of House and started raising slogans denouncing the BJP’s effort to topple the government in Karnataka. The MPs of the Telugu Desam Party and All Inda Trinamool Congress also came to the well of the House. They also raised slogans and waved placards slamming Prime Minister Narendra Modi’s government on various issues. After continuing with the Question Hour for some-time, the Speaker adjourned the House for an hour.